The American dog tick is the most common tick found in Iowa. 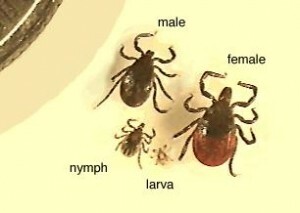 Like all ticks, the American dog tick goes through an egg, larva, nymph, and adult stage during its development. While they may be found throughout the year, adults are most active during late April through May. The larva, nymph, and adult stages must each have a blood meal before they can develop to the next stage. The American dog tick has a fairly wide host range. Adults commonly infest both large and medium sized mammals such as dogs, cattle, deer, raccoons, and opossum. The immature stages may feed on these same hosts but prefer to infest smaller mammals such as meadow mice, squirrels, and chipmunks. 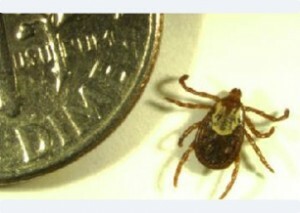 All stages of the American dog tick will also feed on humans if given the opportunity. The deer tick, responsible for transmitting Lyme Disease, is about the size of a freckle. Once attached to a person, the barbed mouth, along with a special glue, allows the tick to hold fast until it has finished feeding.